Conditions have been hot and dry over much of southern Arizona for the past 5 to 7 days. Here in Tucson the high temperatures the last two days were 102 and then 104F. Phoenix has been over 100F each day during past week, with hottest day coming yesterday at 111F (even hotter out at Yuma where it was 113F yesterday). Thunderstorm activity has been pushed far to the south over much of Mexico by the dry air. The plot of CG flashes above is for the 12-hours ending at 06 UTC today (August 31st). Most storm activity was down near the southern third of the GoC or along the Continental Divide - Sonora was almost thunderstorm-free yesterday. Here in Tucson the GPS estimated PW has fallen steadily during the past 5 days and is currently well below an inch. The time series above shows GPS PW on campus, along with the 12-hourly PW from the TWC soundings, also taken on campus from the NWS Office. The 12 UTC analysis of blended PW (from CIRA at Colorado State, above) indicates values of 1.5 inches are confined mostly to the south of about 30 degrees N. The 11 UTC analysis from CIMSS (University of Wisconsin) below indicates about the same. There is still a strong intrusion of very high PW from the tropics into the southern end of the GoC, and it will probably take a tropical disturbance to push the mT air back into the Southwest. The ECMWF does forecast the development of a weak, tropical low near the south end of Baja out at days 6 and 7, so this will be something to watch during the coming week. I used the ERSL interactive web page to take a look at GPS PW for the entire 2014 summer period, since June 20th through this morning. That time-series is shown below. After the jump to high values at the end of June, PW stayed mostly at and above 30 mm during July. The trace for August is more roller-coasterish with numerous ups and downs. The general trend during the last half of August has been down, except for the tropical increase associated with Hurricane Marie last week. Only isolated mountain storms yesterday afternoon in southeast Arizona - see plot of CG flashes through 1 am this morning - August 28th. Six high elevation ALERT stations in Cataliinas, Redington Pass, and the Rincons recorded light rainfall yesterday. We will experience a substantial dry-out for next few days as westerly winds dominate and bring in dry, Pacific air. The dry air reaches down to 700 mb this morning and will continue mixing downward, resulting in dry and stable conditions for the Holiday weekend. The early WRF-NAM forecast for total accumulated rainfall through 11 pm next Saturday night is shown below (on the 5.4 km grid). The Southwest holds very dry, except for some showers over Colorado Rockies early in period. As I mentioned back on the 22nd, the longer-range forecast models were keeping westerly troughiness over the Southwest and it looked like our summer rainy season (aka monsoon) was ending, barring a tropical interlude. The tropical interlude is over and the models continue to keep westerlies dominating the middle and upper-levels. The GFS becomes a bit ambiguous out at 7-days, but basically we'll be watching for transition events with strong westerly short-waves, or more tropical systems heading north. Above and below are the 84-h and 168-h GFS ensemble means for 500 mb. Two reports of almost 2 inches from yesterday's small storm near campus. The rain gauge at the Water Resources Research Center just off campus recorded 1.73" yesterday between 2pm and 4pm! NOTE - I can't get this link to work unless I copy it and paste in browser - there are interesting time series at the link. I also had 1.8 near campus in my rain gauge, very small zones of rain indicated on rainlog.org. Here is plot of rainlog reports from near where storm developed along track to northeast to where it crossed Rillito and apparently weakened quickly. Note one report along the track of over 2 inches. A small thunderstorm developed nearly over campus early yesterday afternoon and moved slowly across this part of town. View above from campusat 3 pm shows the storm about to end here at house. We had south wind gusts of 40 to 50 mph briefly and a heavy downpour that left 0.93" in the gauge. Atmo recorded 0.90" and several other stations hit by this cell had over 0.75" - see metro west sector of the ALERT network below for 24-hours ending at 7 am MST. Across the network 47 of 92 sites measured rain, with 11 stations having over half an inch. Keystone Peak was only station with an inch or more and that gauge caught 2.36 inches. The Carr RAWS station had just over an inch. Plot of CG flashes 2nd below shows that storms mostly stuck to higher terrain, except for the small cluster of flashes over the metro area. This morning's sounding from TWC on campus (above) still exhibits substantial CAPE, although the westerly winds will be drying Arizona out during the coming 48-hours. There is enough moisture to support some continued thunderstorm activity today over southeast Arizona, especially over higher elevations and along the Borderlands. The early WRF-NAM forecast of PW below is valid at midnight tomorrow night and shows how dramatic the dry-out forecast by models is. Pattern at 500 mb for next 10 days is forecast to continue with mostly westerly winds so we will head into September having to keep an eye out for tropical activity. The unstable air mass yesterday led to storms developing over higher elevations quite early in day. Photo above shows updraft bases lined up along the Baboquivari Mountains at about 11 am. 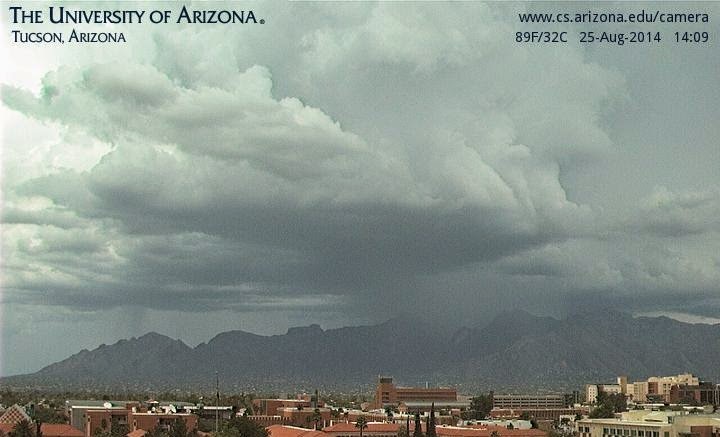 Photo below from campus shows storm over the western Catalinas about 2 pm MST. This storm tried to build southward over north part of metro but didn't persist. It produced one very loud crash of thunder here, but no rain at all. Most of the day the bad wind profile moved thick anvils over lower elevation areas and little else. Plot of CG flashes through 1 am this morning indicates heaviest thunderstorm activity in Pima County was out west of Tucson metro - note the common doughnut hole over metro Tucson. 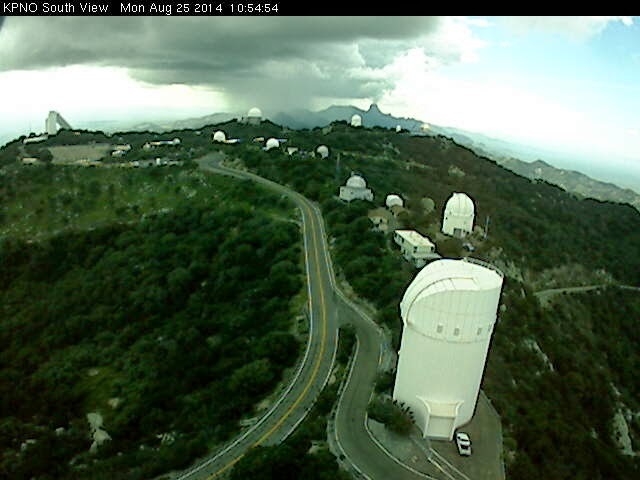 The metro/west sector of the ALERT network shows no rain for past 24-hours, except out in the Tucson Mountains. Only 31 of 92 ALERT stations measured rainfall during past 24-hours. There were 9 sites with more than half an inch and 1 with over an inch. This morning's TWC sounding (above) is cooler in low levels and, although PW remains high, has considerably less CAPE than did yesterday morning's sounding. Both versions of the early WRF from Atmo forecast afternoon storms across most of southeast Arizona again today. Total rainfall forecast through midnight by WRF-NAM is shown below - note that better rain amounts again hug the higher terrain. The GFS version is considerably wetter than NAM version over the mountains. Note that the wind profile again favors anvil clouds over lower elevation regions. There will probably be more sunshine and better heating today before storms develop, so for low elevations it's a bit of a coin toss today. Only time for a very quick look this morning as I have appointments on the east side in just a bit. Thunderstorms to the south and east of Cochise County pushed outflows across southeast Arizona last night. Low-level moisture across southern portions of the state has increased, and PW is around an inch and a half this morning, with very high dewpoints noted out in the lower Colorado River Basin. Lighting CG flash plot above is for 24-hours ending at 1 am this morning. Blended PW analysis from CIRA (below) is for 6 am MST this morning. 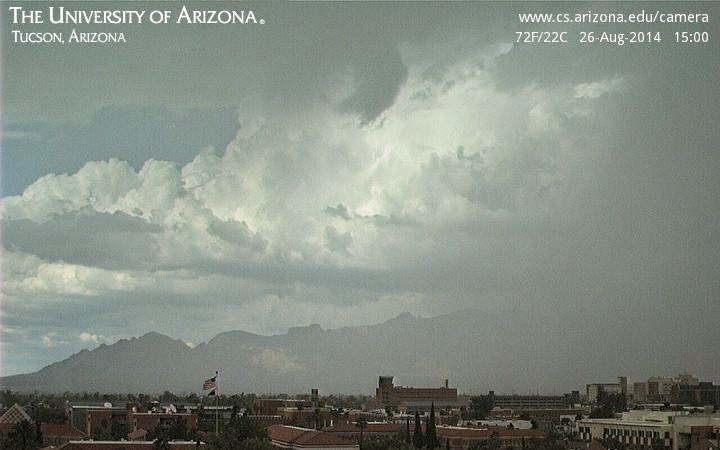 The moisture surge associated with Marie has made it into southwest Arizona. The morning sounding data from TWC are shown above on the skewT from SPC. The sounding is very unstable due to both the increased low-level moisture and cooling above 500 mb. Winds below 400 mb are very light from the south. Upper-level winds will push storm anvils off to the east. The sounding indicates that heavy rains are a threat today, as well as strong, moist downburst winds. So very substantial changes have taken place since yesterday. The early WRF forecasts from Atmo had heavy storms by sunrise over eastern Pima County and thus were jumping the gun on today's storms, but both versions indicated very heavy storms today. The NHC has upgraded Marie to a Cat.5 hurricane with sustained winds of up to 160 mph. Visible image of the storm at 21 UTC is above, while IR image from same time is below. Northward surge of low-level moisture associated with Marie continues up the GoC this afternoon - blended PW analysis from CIRA at Colorado State is above for 20 UTC. Values of 2 inches or more (red and purple shades) have now reached about 2/3rds of the way up the GoC. The time-series of GPS derived PW from on the sensor on campus is shown below from ERSL. Values have been increasing slowly during the day today. Satellite IR image above is from 5:30 am MST this morning. 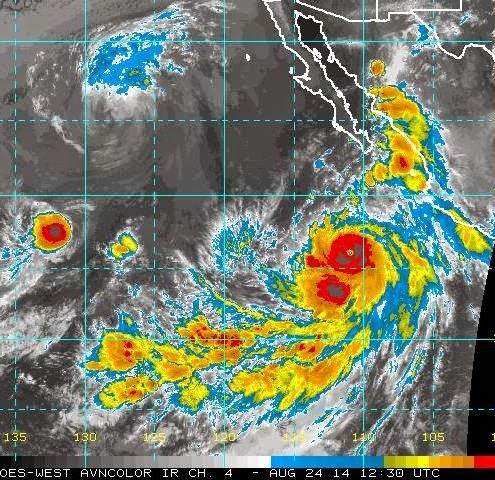 Hurricane Marie has strengthened into a Category 4 storm and is moving west-northwestward well off the coast of Mexico. 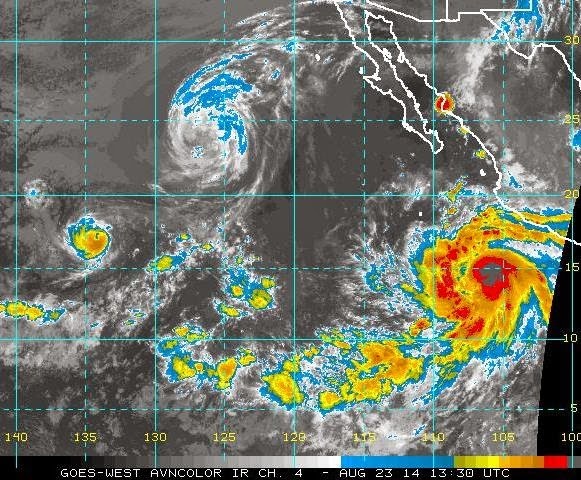 Marie is a very large storm and convection associated with a push north of mT air is already reaching well into the GoC and Sonora. Karina is now a tropical storm and may be absorbed into Marie in a couple of days. Lowell is now a remnant low west of Baja. CG lightning flashes have been widespread through the night and reach into Sonora with active storms at sunrise. Plot above is for 12-hours ending at 0330 UTC last evening. Plot below, also for 12-hours, is for period ending at 1300 UTC (6:00 am MST) this morning. 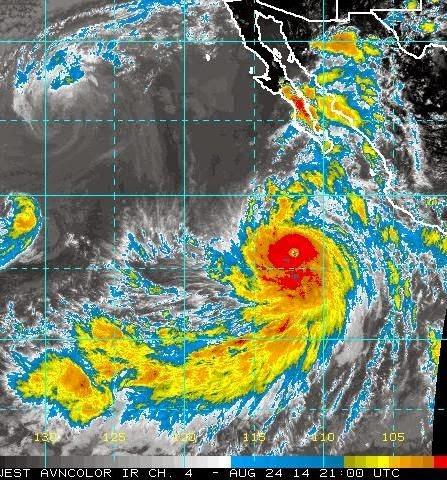 Various forecast models are indicating that Marie will have a significant impact on the Southwest and southern California. I have looked at the early runs of the WRF models from Atmo - some of the loops available are very impressive. Graphic above is the WRF-NAM forecast of PW, on the 5.4 km grid, valid at 6 pm MST on Tuesday the 26th of August, indicating PW over 2 inches into the lower Colorado River Basin. The WRF-NAM forecasts an active day for southern Arizona tomorrow (with just isolated convection over southeast corner of Arizona today). Forecast of composite radar echoes below is valid at 2 pm. The GFS version of the model forecasts most widespread thunderstorm activity for Tuesday the 26th. The model's forecasts of rainfall are impressive. Above is WRF-NAM forecast of accumulated rain through midnight tomorrow. Forecast below is from the WRF-GFS for rainfall through 11 pm on Tuesday night the 26th. 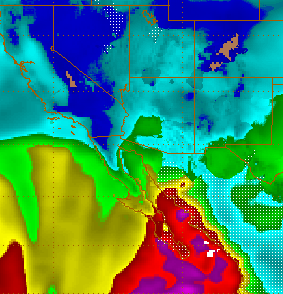 The NWS NAM model forecasts from both 00 UTC and 06 UTC forecast a significant precipitation event for most of Arizona. So, the new week will be off to a much different start and we will have to wait to see how the details of the potential weather event evolve. First a brief summary of yesterday - thunderstorms were much diminished across southern Arizona with lightning flashes confined essentially to Cochise County. Here in eastern Pima County there were isolated, low-top showers during the afternoon. Across the ALERT network 7 sites of 92 had very light rain amounts. Here at the house there were evening showers between 6 and 7 pm that produced 0.05". So, a nice surprise to get a last bit of rain from the departing weather system. 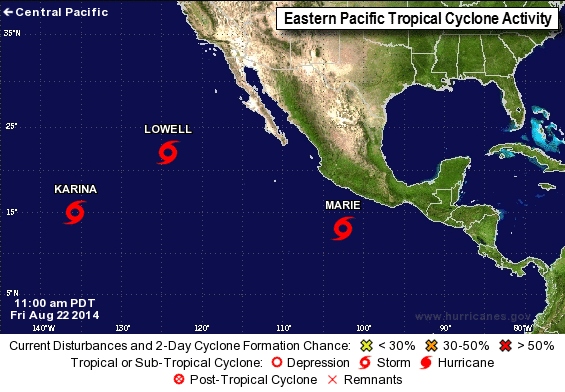 Marie is now officially classified as a hurricane by the NHC (see above), as is Karina again. The 1330 UTC IR satellite image this morning (below) shows the three storms. The spatial extent of Marie is impressively large. This morning's NHC forecast for Marie is shown above. The NHC forecasts Marie to quickly intensify to a Category 4 hurricane. Lightning flashes on the plot below (CG flashes through 1330 UTC this morning) include some from storms at the outer, northern edge of Marie and also morning storms in the southern GoC. The early WRF-NAM model forecasts from Atmo indicate that Marie's large circulation will push substantial moisture back into the Southwest, rather quickly. The forecast of PW above (on the 5.4 km grid, valid at 11 pm on Monday night the 25th) has pushed increased PW northward all the way to Lake Mead. Both versions of the WRF model bring thunderstorms back into eastern Pima County late tomorrow afternoon, with much increased activity across southeast Arizona on Monday. 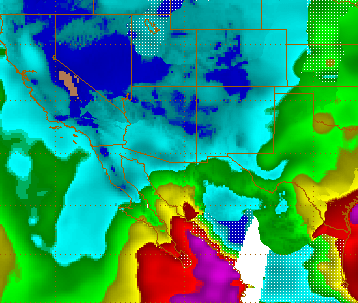 The forecast below is WRF-NAM on the 5.4 grid for total rainfall through 11 pm MST next Monday night. So, quite a quick turn-around from the down day of today, at least in the models' worlds. 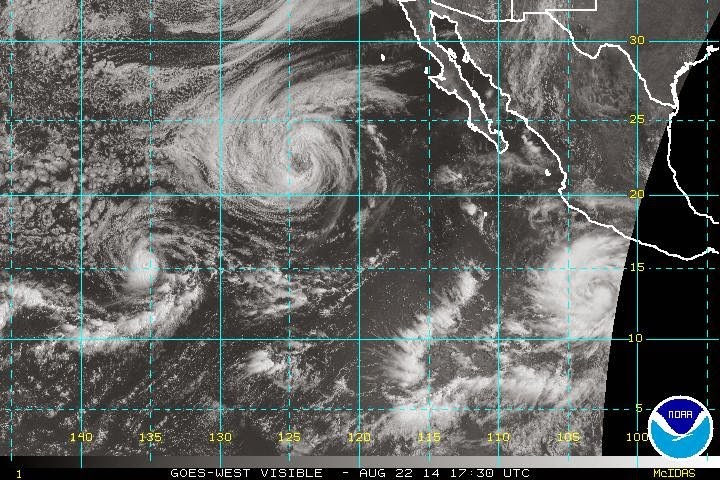 Three tropical storms now over eastern Pacifc as per above NHC graphic. The visible image from this morning (below) shows the three. At bottom is current NHC forecast for Marie, which is expected to become a hurricane shortly. One of the big "ifs" yesterday was how long the dreary and thick cloud cover would persist and, unfortunately, the answer was basically all day. As a result there was little in the way of thunderstorms and rainfall here in southeast Arizona. Only 14 of 92 ALERT stations had rainfall yesterday. The metro west sector of the ALERT network is shown above for the 24-hours ending at 7 am this morning (August 22nd). This was the most active sector and the 2/10s of an inch at the Santa Cruz and Ina site was the ONLY report of a tenth of an inch or more. Here at the house we had 0.01" from several brief periods of very light showers. So, a serious down day. Most of the heavy storm activity was out in the southwest and west part of the state, as shown by the CG flash plot for the 24-hours ending at midnight last night. There were numerous heavy storms out there and they were rotating rapidly around the mid-level cyclone - some radar loops were quite spectacular. 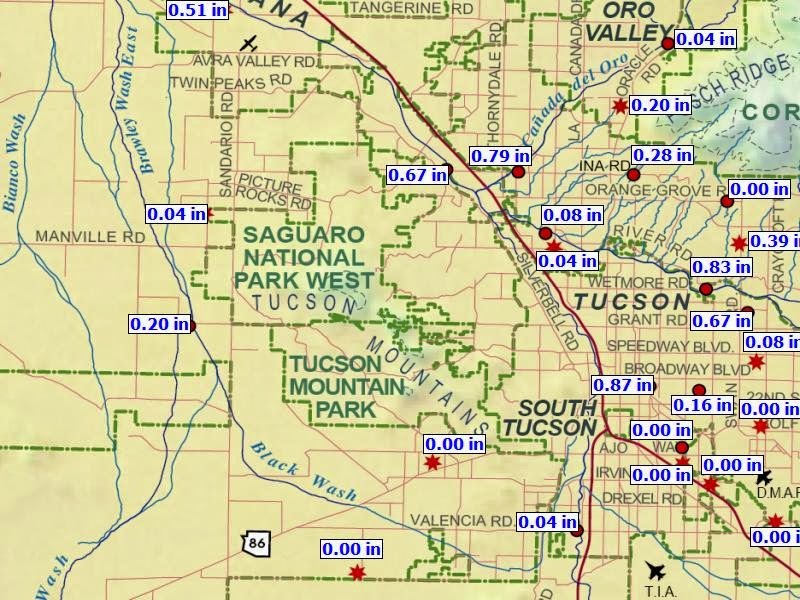 The rainfall was also most significant west and northwest of the Tucson area - below is MesoWest plot of 24-hour rain reports through 7 am MST this morning. The morning sounding at Tucson has some CAPE left this morning and there may be a bit more mid-level cooling before the 500 mb trough passes around noon. So, there will be a chance for isolated thunderstorms, mostly on and to east side of the mountains through early afternoon. The models show marginal amounts of low-level moisture sloshing back and forth across southern Arizona for next several days. The global models are a bit at odds for the longer-term. The ECMWF keeps enough troughiness over the west to bring the summer storm season to a close. The GFS is bit more ambiguous, but definitely marginal for southern Arizona. The wild card during the next 7 days will be Hurricane Marie - this is forecast to be a large storm and, even though it stays well west of Baja, the GFS forecasts a significant push of moisture into the Southwest associated with the storm. Will have to watch how this evolves. There were isolated thunderstorms yesterday in eastern Pima County, mainly over the high elevations. The CG flash plot above is for 24-hour CGs up to midnight last night. The most storm activity occurred out to the west. Several storms near the Colorado River and also near Quartzsite had quite strong radar echoes. Across the ALERT network in eastern Pima County 10 high-elevation sites had rainfall and three of these exceeded half an inch. Keystone Peak, west of Green Valley, had the most rain at 0.75". Sunrise this morning had a bit of blue to the east but with heavy cloud cover moving overhead. Photo above was from along the Rillito looking toward Redington Pass at about 5:40 am MST. The visible satellite image below (for 7:30 am) shows that these clouds extend southwestward to TS Lowell. The big forecast issue for the day will be whether or not the clouds will break enough to allow significant BL heating. The Tucson morning sounding (skewT below from SPC) is fairly moist through entire troposphere and cooling of a couple of degrees has occurred in layer above 500 mb. This cooling, with the increased moisture, results in a modest amount of CAPE today, even at low elevations. Winds are strong in upper-troposphere ahead of the cyclone spinning near San Diego this morning - this feature will only move slowly eastward today. Winds in the lower troposphere are southerly but quite light - an increase in the low-level winds would improve the shear profile to one that might support organized thunderstorms. The early WRF forecasts from Atmo keep strongest storms well to the west this afternoon. Both versions forecast isolated to scattered storms in eastern Pima County, with the GFS version having more activity in its forecast. So it is a day characterized by a lot of "ifs" at this time. More Storms At Low Elevations Today? 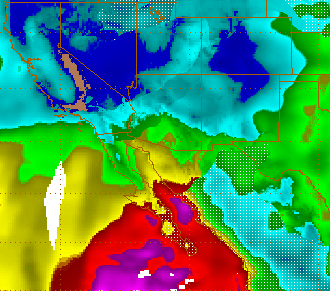 Low-level Moisture Push Into Pima County Today?